Is there a best way to practice on your guitar? Of course you have to make your practice sessions effective but could there be a way to practice that is more effective than other ways? A motivation founded on a love and passion for the music you can produce on the guitar. An acceptance of the fact that you must practice on that technical level you have reached. A working knowledge of muscle tensions and how to minimize them when you play and how to work on reducing them when you don't play. What shall we do until we find the most effective way to practice on the guitar? When I was studying music at an academic level I many times had the question messing around in my mind about the ultimate method for practicing on my guitar and other instruments I played. A well renowned jazz tenor saxophonist who was my teacher in jazz improvisation discussed this issue with me as I asked him and he gave me the most intelligent answer I ever heard before or after. He said with a smile, "until you find out the best way to practice, practice anyway!" How effective can a practice session be? My humble opinion after much practicing and playing guitar and piano and other instruments and also teaching piano and guitar is that you have to take many things into consideration like the time available, your motivation level, how concentrated you can expect yourself to be and more. As real growth often is a slow gradual process you will not very often be able to measure the effectiveness of a practice session by how much you have learnt so you have to find other ways to find out if you are effective. Can you practice too much or too effectively? It depends on how we define effective practice sessions. If effective guitar practice is to work through a long list of things to improve in your playing and to practice ten hours a day without interruption I guess you can practice too effectively. This will mean that you practice in such a way that you will get fed up with guitar playing and maybe you will even hurt your muscles and develop an aversion towards guitar playing for the rest of your life. 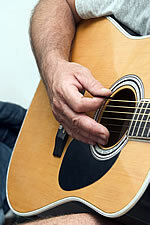 What is real effectiveness when you practice on your guitar? Real effectiveness is better measured by how well your practicing methods and results are pointing towards you goals. Without goals you cannot measure effectiveness. The roads to Anywhere are many so to find out if you are on the right road you have to decide your destination. If your goal is to have fun with your guitar then you have a very effective practicing session if you have fun with your guitar. If that is what you want then it is a worthy goal. I guess you could come upp with more specific goals with deadlines so you can measure them better. But it is up to you to decide your own goals, otherwise the goals will not be effective. I hope these words on practicing guitar playing will give you some comfort and also help you realizing that when human beings like you and me are involved we cannot definitely say how we ought to play to be effective. Human beings are funny things that sometimes behave like as if they were identical, but nevertheless they are unique. This also applies to guitar players like you and me. We are different in many ways but I guess we want our guitar playing to contribute to our happiness and joy so have fun and ... "until you find out the best way to practice, practice anyway!"! Article written by Peter Edvinsson "Article Source: http://www.articlerich.com "